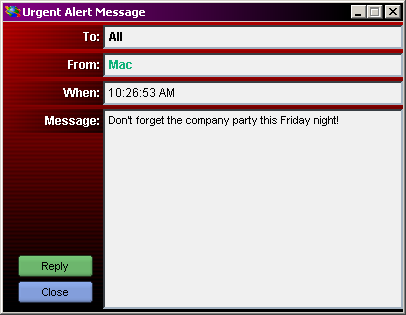 An alert is a message that pops-up on the screen. 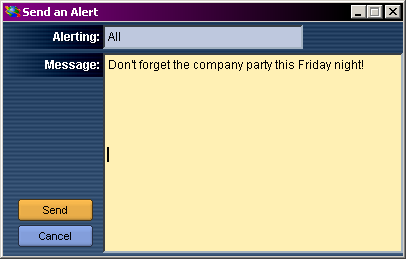 Use an alert when you really need to get someone or some group's attention. Sending a lot of alerts is annoying to other users. If you abuse alerts, the Worldmaster might kick you out of the world, (and there's no way to get back in other than beg). A message panel will open, and you can type your alert message. Keep it short and to the point. When you are ready to send the alert, click on the send button. The alert will be sent immediately, and if the user is online, the alert will popup on their screen. If the user is not online, the alert will popup the next time they visit the world. 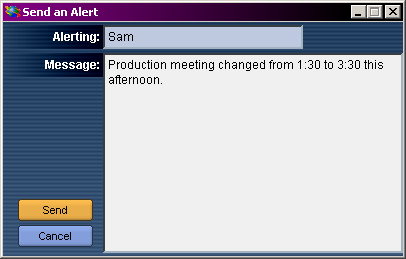 A message panel will open, and you can type your alert message. When you are ready to send the alert, click on the send button. The alert will be sent immediately. 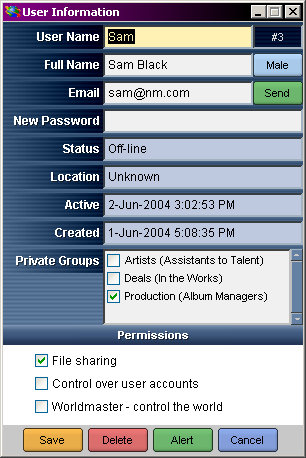 Users who are online will see the alert popup on their screen. Users who are not online will see the alert popup the next time they visit the world. When an alert is sent, it is also copied to the appropriate chat box. You can tell that it's an alert because the date field turns red. When you receive an alert, you can reply to it by clicking on the reply button. This button is simply a shortcut that takes you directly to the chat area for the user who sent you the alert. If you are already looking at that chat area, then nothing happens. After 15 days, an alert will no longer popup when a user (who has been offline for that time) visits the world. 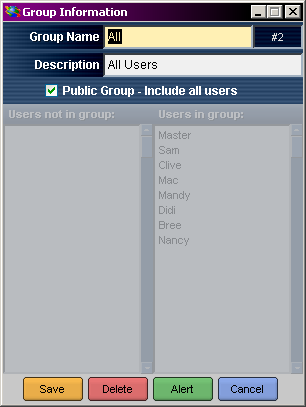 However, alerts can still be seen in the chat panel. This feature prevents new users from being flooded with alert messages when they first logon. Only alerts from the last 15 days will be seen. Just like messages, alerts cannot be removed. They will eventually scroll off the top of your chat message box. CTRL-S Will send the alert message just typed. ESCAPE Closes the alert sending window, or an alert that has just been received. You will be able to specify the duration of an alert - how many hours or days you want it displayed (or permanently).